When selecting rustic glam decor or any wall decoration for that matter, you need to get the right size. To determine the correct decor size, remember that you should not allow your room to overwhelm your decor, nor your wall decor overwhelm your living space as neither would look or feel good. If there is already a lot that is going on within the room/wall, then opt for a large piece. A statement wall decor will give your room its focal point as well as a place for your eyes to rest. Too many small decorations in a single place will make your room look and feel cluttered. Small pieces, on the other hand, have the tendency to get lost within a wall. Only add a small piece on small wall spaces. When buying wall decor, it will all boil down to a single point which is the kind of piece that you love. The wall decor that you have within your space will reflect on your persona. Just be natural and indulge as much as possible. Also, explore the pieces that suit not just your living room but your traits as well. Now that you know how to select a good piece for your home, check out our top picks! Rustic glam wall decor made of metal is in vogue nowadays, which means this is just the piece that you're looking for if you want to update your home's look while illuminating a relaxed rustic decor. Since it measures 12.5 x 12.5 inches, it can fit gallery walls or work together when combined with other stunning wall decors. Another ornate wall decor made out of a metal sheet is a masterpiece of Ophelia & Co. It's both rustic and glam, which makes it the perfect piece to express what you like and who you are. It is a vintage-inspired decor for walls, so, naturally, it comes embossed with intricate fleur-de-lis details and finished off with a signature distressed brown finish. This one fits any home styling or theme, may it be traditional or contemporary. It's geometric shape-inspired, and it's made out of wire and ceramic, making it durable and capable of being used as a planter or storage for office/home items. If you have an empty wall in your home and you want the easiest solution to your problem, then hang this set of two at the same exact height to fill the blank space. A versatile and glamorous wall decor, this piece can also be used as a sophisticated table accent with its clean-cut fringe and faceted marble effect. Since it has a solid pattern and sheer light filtration, it is best used inside a room that is bright as it is capable of diffusing light from a window. If you are busy but you wish to get a stunning result out of your home decorating project, then go for this one. It can already make a statement on its own due to its decorative accents, and it can be used both indoors and outdoors. It's a handcrafted piece by Designocracy, so it can lend your space a personal touch. 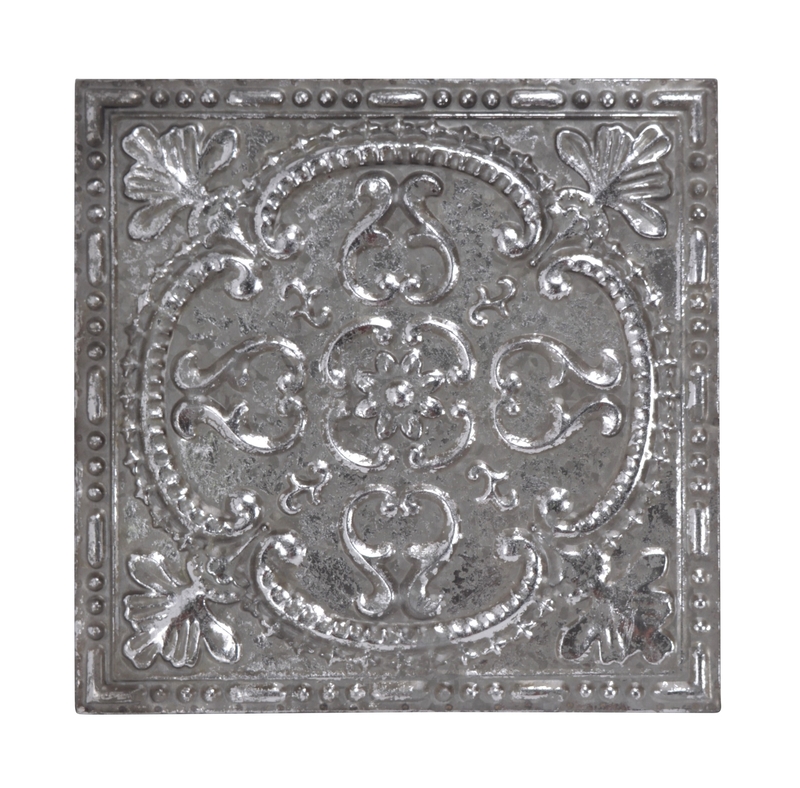 This floral wall decor with a silver finish is a rustic and glamorous wall decoration that is perfect for living rooms. Since it has a homey look, it can be used in accentuating a wooden furniture's design. Although it is a large piece, you won't have any problems regarding its installation as it's been designed for quick and easy mounting. One of our favorites in the category, Rustic Glam Decor, it's both charming and unique with its simple flower design and gold finish. It is lightweight and it comes ready to mount on any surface. Because it is a layered wire floral wall decor, it is an excellent addition to your space if you are looking into adding texture to it. A bestseller from Stratton Home Decor, this piece makes for a trendy and chic art installation. It is the perfect style statement as it expresses your artistic side without overdoing it. The simple lines, curves, and down-to-earth color all add an industrial look and feel to living spaces. Window frames have long been used as wall decor, but this one is the best old rustic barn piece that we can find. It's understated which is exactly what makes it trendy despite its old school appearance. What we love most about this piece is the fact that it's made from recycled materials! The last wall decor piece on our list of the top rustic glam decor has a versatile design and distressed finish to bring out a rustic flair to a wall decoration. It feels right regardless of where it is incorporated in, may it be your living room or bedroom. The wood used was painted and sanded in order to give the piece an antique look.